Automate your orthopedic prior authorizations with software driven by artificial intelligence (AI) and exception handling by certified specialists to preserve more revenue. Prior authorization requirements in medical clinics create difficult challenges. Clinics must deal with a vast array of CPT codes, possess a team that can understand the authorization requirements, and keep up with the endless guideline changes. 90% of doctors say prior authorization infringes on quality patient care. Add referrals to the mix and you add an entirely new layer of complexity. Managing determinations, decisions and status changes requires automation that most clinics don’t have with their existing EHR systems. They need an integrated platform for automating complex processes and an expert team that can handle exceptions. 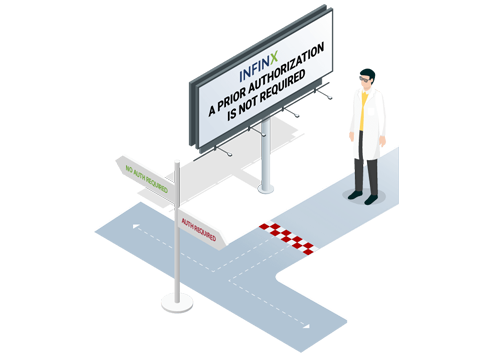 Infinx’s Prior Authorization Software for medical clinics blends automation, integration, cognition, and control to offer you an optimized workflow. It leverages artificial intelligence (AI) to optimize your processes, including our real-time No Auth Decision Engine, making it easy to discover cases that don’t require waiting for approval. Cases needing more in-depth attention are forwarded to our global team of specialists who can process your prior authorizations with speed and impeccable accuracy. The software pulls this information via an HL7 message from the client’s system. learn more about our prior authorization software for medical clinics.